Achievement of malaria elimination requires development of novel strategies to interfere with parasite transmission. Plasmodium falciparum transmission stages develop in red blood cells that sequester in the bone marrow, and that appear only as mature stages in the peripheral blood. Our goal is to decipher the cellular mechanisms underlying sequestration of infected red blood cells in the bone marrow and their release into the bloodstream, and to establish that these mechanisms may be new targets to block malaria parasite transmission. Malaria remains a major global public health problem with 1 million deaths annually. Achievement of malaria elimination requires development of novel strategies targeting the parasite sexual stages (gametocytes) to interfere with parasite transmission. The formation of Plasmodium falciparum gametocytes in the human host takes several days in which immature gametocyte-infected erythrocytes sequester in the bone marrow, and appear only as mature stages in the peripheral blood. The release and persistence in bloodstream are prerequisites for mature gametocytes to be taken up by mosquitoes and ensure parasite transmission. Our goal is to decipher the mechanisms underlying gametocyte-infected erythrocytes sequestration in the bone marrow and release into the bloodstream, and to establish that these mechanisms may be new targets to block malaria parasite transmission. Using a new nanotechnology that mimics splenic filtration in vitro (Lavazec et al, Methods Mol Biol 2013), we have shown that an increase in infected erythrocyte deformability occurs in mature stages, leading to a restored ability of infected cells to circulate through the spleen (Tiburcio et al, Blood 2012). This observation led to the exciting hypothesis that gametocytes sequestration may be dependent on stiffness-mediated mechanical retention in the bone marrow, and that their release in blood circulation may be due to a switch in deformability of the infected cell. 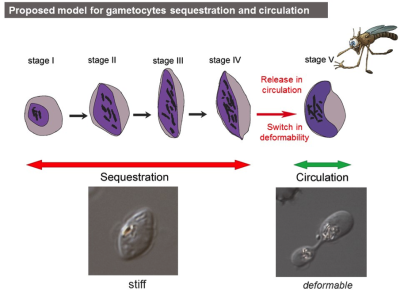 Our team propose to decipher the parasite-mediated stiffness of immature gametocyte-infected erythrocytes, to determine the mechanisms underlying the switch in deformability of mature gametocytes, to evaluate in vivo the role of cellular deformability in gametocyte sequestration, and finally to establish the proof-of-concept that gametocyte deformability is a transmission-blocking drug target.